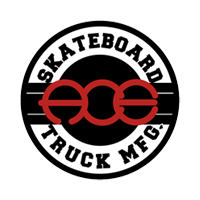 Ace trucks were founded in 2006 by Joey Tershay and Steve "Shrewgy" Ruge. Ace pride themselves on being the only truely independent skateboard truck on the market today. Ace trucks come in a variety of different sizes & designs, their most popular model is the 33 model which fits skateboard decks sized 7.75" - 8.25". They also offer the 44 truck which fits skate decks sized 8.25" - 9" and a 55 model which fits decks even wider. All Ace trucks feature a slim hangar design which is similar to the old Independent Stage 3 trucks. Backed by the likes of Raven Tershy, Tom Remillard, Ronnie Sandoval & Brad McClain you know Ace Trucks mean serious business in the skate truck game! !